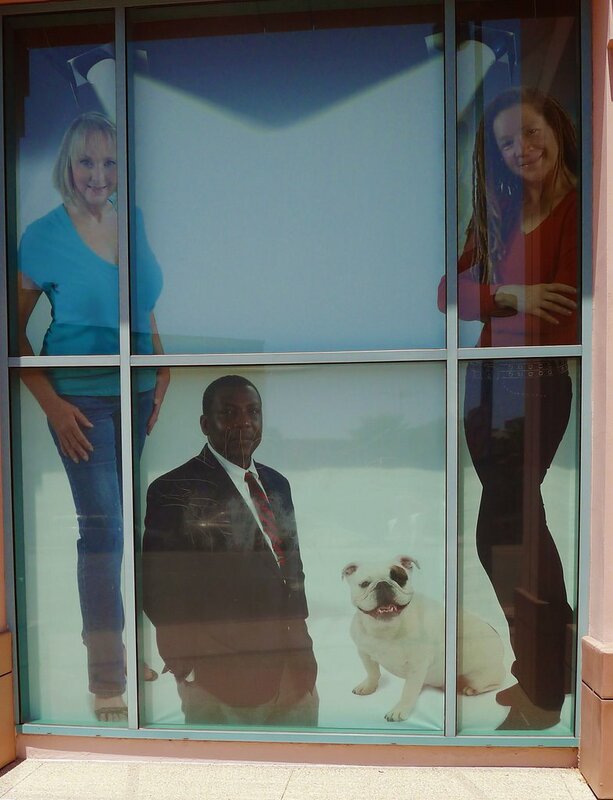 There are two women, half a man and a bulldog bathed in spotlights. The man is in the lower part of the picture and he doesn't look very happy about it. I'm guessing from the suit that he works in a bank that isn't doing very well. Or maybe he's upset because he doesn't have any feet. The women, on the other hand, seem quite content. Perhaps they are pleased that they are in the superior position and there is half a man below them. Perhaps they had something to do with that arrangement. Female power at its most provocative. And then the bulldog with the big smile. It's fat and has no reason to be happy because it's probably suffering from the usual long list of medical problems that bulldogs suffer from. It is smiling through the pain. It probably has a name like Brutus and likes to attack other dogs. It's weird. I know. I really can't figure it out. "Grandpa, can you come over while I yell at my lover's crotch?" "Sure, hon. Should we all get naked?" "Sounds great. See you in a few." This was taken a couple of years ago when I was in Amsterdam. I have NO idea what this sign is trying to convey but it did leave a lasting impression.